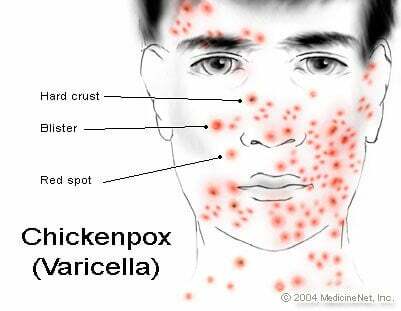 Varicella (chickenpox): A highly infectious viral disease, known familiarly as chickenpox. (In many countries, this disease is always called "varicella.") In rare cases, it can cause major problems including pneumonia and encephalitis. Reactivation of the same herpes virus is responsible for shingles(zoster). Chickenpox is responsible for more deaths than measles (rubeola), mumps, whooping cough (pertussis) and H. flu (Haemophilus influenza type B) meningitis combined. Contrary to what many people believe, chickenpox is by no means a mild disease. The current aim in the U.S. is to achieve universal (or come as close as possible to universal) immunization of children with the chickenpox vaccine. The rationale for childhood chickenpox vaccination is not just to protect the children but also to protect everyone with whom they come in contact, including adults (who can die from the chickenpox) and pregnant women (so that the unborn baby does not get chickenpox).